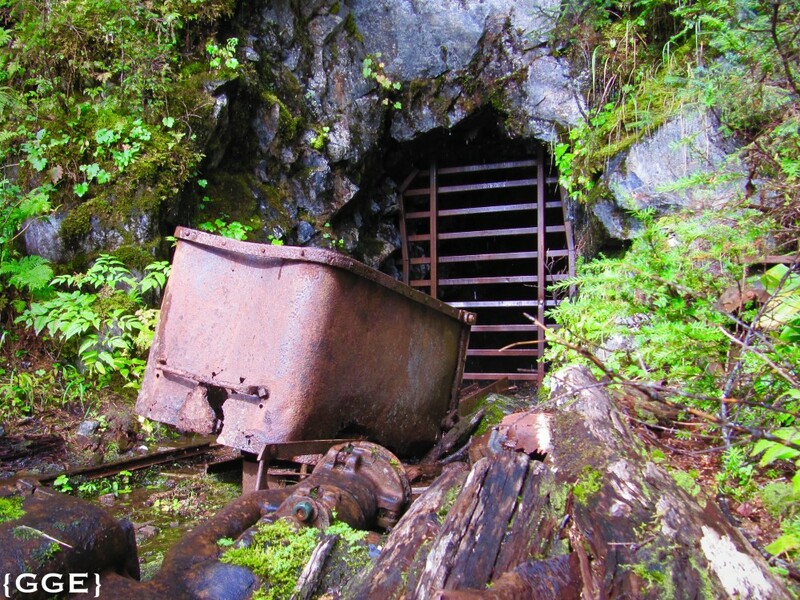 I have always been fascinated with gold rush stories from Alaska and was more than excited when I learned we were going to hike to a 100 year old gold mine! Experiencing a piece of the Alaskan gold mining history had been high on my wish list. 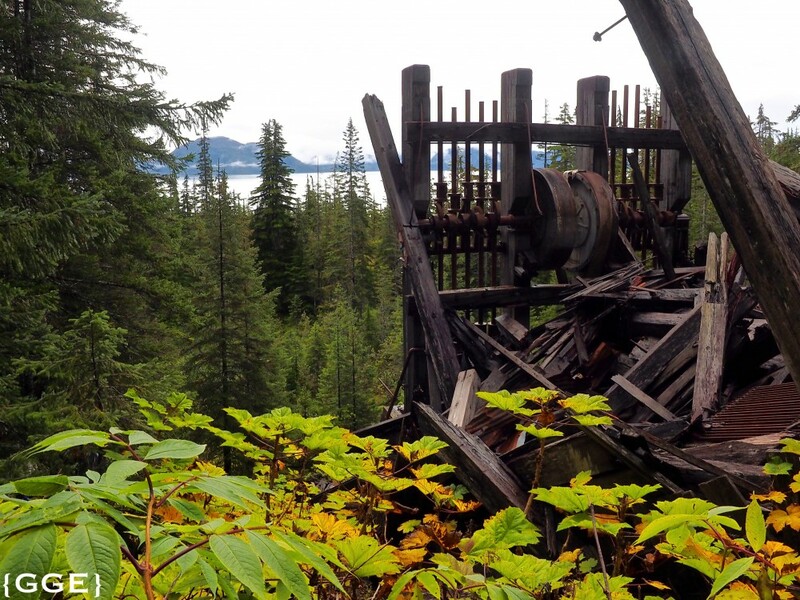 Copper and gold mining was big in Prince William Sound late 1800s – 1930s. World War II interrupted the mining operations as gold mining was declared a nonessential wartime activity. Our hiking destination for today was the Granite gold mine, described as one of the most productive properties in the district. Most of the production occurred between 1914 and 1922. When the mine started up they had 50-70 men working here. The has been some activity in the mine after WWII, but with minor production. We started our hike in Hobo Bay and walked on yellow and orange bog along the shore for a kilometre or so before we started the climb. One we started the climb the trail was modified in some sections by wooden logs being put down to prevent erosion. 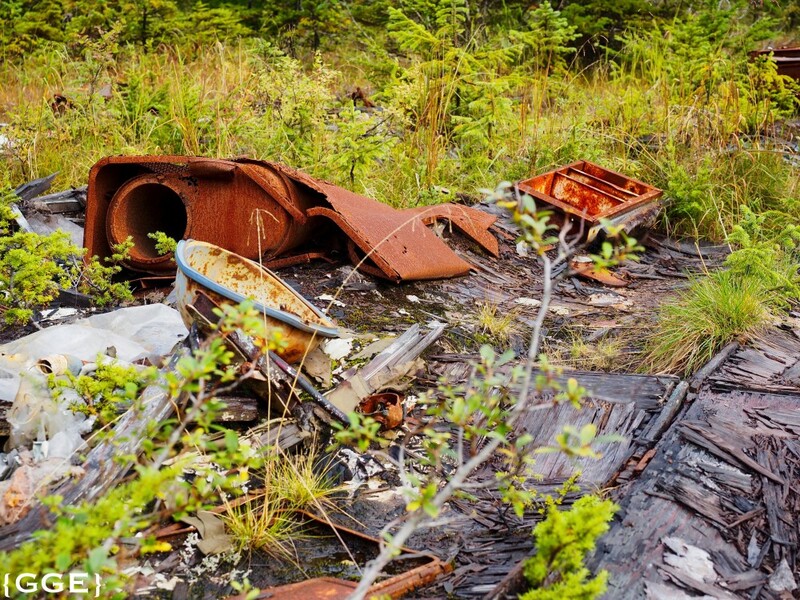 The first signs of gold mining activity we come across seemed to be what was once a mine camp. The building itself was not standing anymore, but there was a sink, fridge and bed standing where the camp once had been. It looked like most of this was more recent than from the initial build in 1914. I would be very surprised if they had a fridge up here 100 years ago! Around the corner we found a old abandoned Caterpillar bulldoser. I was very excited when we got to the stamp mill. I was not expecting it to be as intact as it was. A stamp mill crushes the ore down to a powder by pounding down stamps on the material. As a machinery engineer it was interesting to study the mechanism of this unit. The large timber logs holding up the cams, shafts and iron stamps were still intact. From what I could count this was a 10 stamp mill (10 stamps). The stamps were arranged in sets of 5 with each set having a drive wheel. On one of the drive wheels the drive belt could still be observed. I am not very familiar with gold mining principles but based on the small pipes routed to the stamps it seems like water was used in the crushing process. After crushing the ore to a powder the amalgamation process with mercury would be next step, allowing for the final extraction of the gold. I borrowed the picture below from Powerhouse Museum – this is how I imagine the set-up must have been at the Granite gold mine as well as I found information saying they used amalgamation tables. 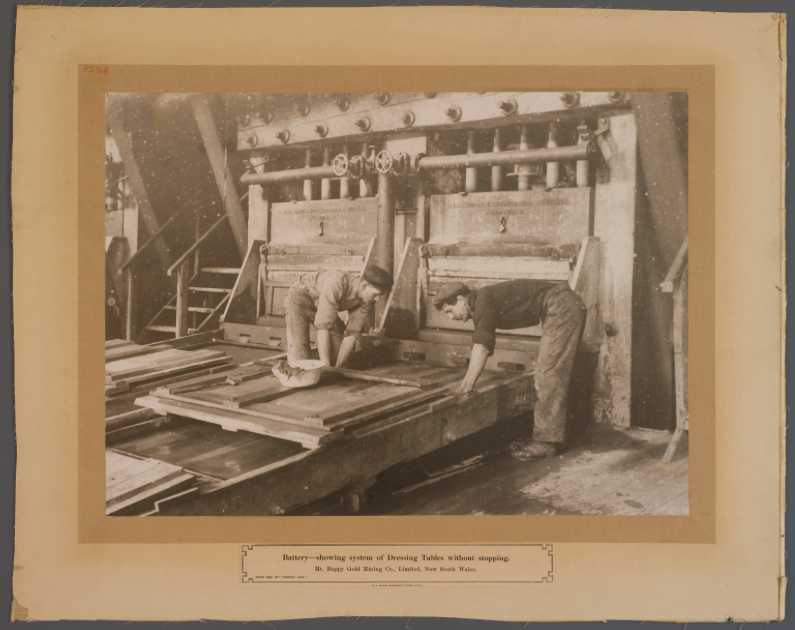 The tables typically had copper plates coated with mercury which caught the gold by amalgamation as a stream of water carried the crushed ore from the stamp mill down the table. When we got up to the mine shaft at about 700 feet elevation from sea level we found the entrance to the mine was closed. Not unexpected. The mine is private ground and the mine shafts are uncontrolled and can be dangerous. There was a lot of old mining equipment at the mine shaft. An old mine wagon was sitting just outside the mine entrance and there was some sort of drill machine close by. Old iron bars and hydraulic hoses were scattered around. The only new thing was the lock on the gate into the mine shafts. For some reason I got the impression of it being a small mine when looking at the entrance. It definitely didn’t reveal that the mine consists of about 8,200 feet of workings and that 31,919 tons of ore containing 24,440 ounces of gold and 2,492 ounces of silver was extracted here. 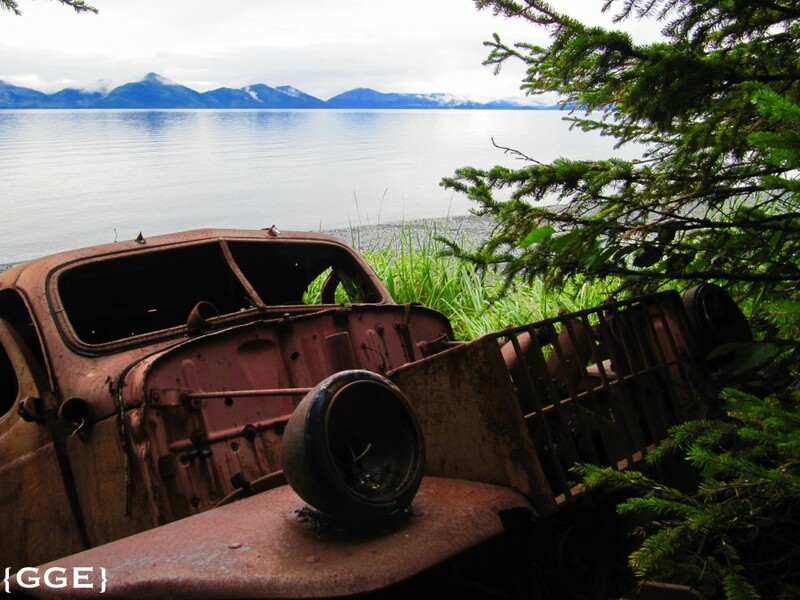 On our way back to the beach I was surprised to see this old rusty car in the woods close to the trail, but later I learned there was actually a road from the shore to the mine camp and the workings when the Granite gold mine was active. We got down to the shore again midway between Harrison Lagoon and Hobo Bay, where we relaxed on the beach while we waited for the boat to pick us up. Despite my initial enthusiasm I had mixed feelings after this hike. On one side it was exciting seeing the remnants after the gold rush, but on the other hand it didn’t feel right that mining equipment was left scattered around the area. 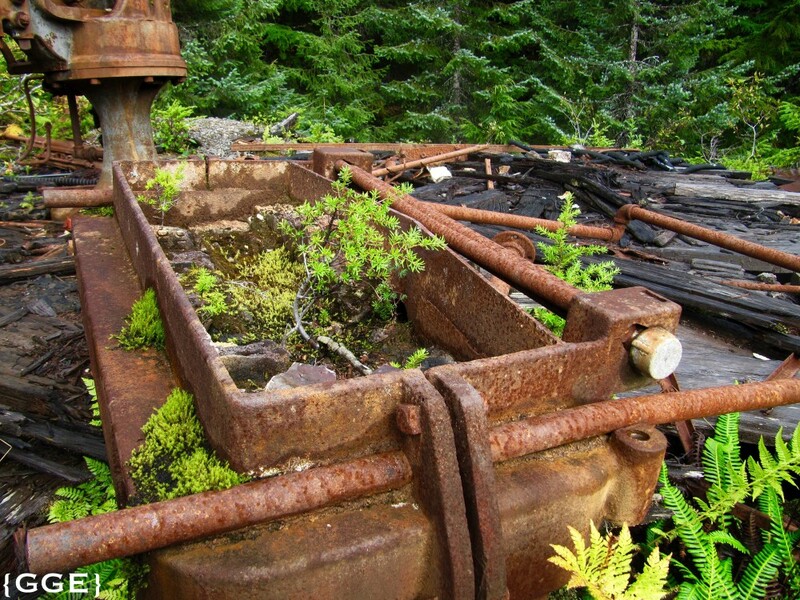 And how many more of these abandoned mines are left in Prince William Sound. Who is responsible for cleaning up the mess. Could the scattered debris and tailings from the copper and gold mining industry could lead to metal contaminations that would drain to the ocean and be a risk for the marine environment? It is sad to see how some industries treated the environment, Inger. It does serve as a reminder to be better stewards of the world we live in, though. I agree with you Jim. We can only hope we have learnt from the past treating the environment better in the future. There definitely need to be some security for ensuring the mining activities get cleaned up should a company get bankrupt. I know here in Alberta government collects financial security from mining companies to ensure there will be money for reclamation (and that the tax payer does not get stuck with the bill) should a company go bankrupt etc. Unfortunately less developed countries might not have the same regulations. And obviously this is unfortunately something that is a result of lessons learnt where clean up or reclamation has not happened. Thanks for stopping by and taking the time to leave a comment. The gold rush stories are quite exciting. It was fun to see a piece of it. We didn’t get any specific warnings, but there was tailings in the area so I am sure there would be some ‘leftovers’ from the process. Thanks for the Skagway tip, we will for sure check it out if we get the chance. Thanks for taking the time to leave a comment Jim! Wow, I guess you need to take care exploring these old mines. Hopefully they had proper personal protection. I am glad it was only his shoe that melted away! Thanks for the warning, I’ll remember it. My guess would be it is the responsibility of the company but difficult to enforce I am sure. Lovely photos. I like exploring old sites like this too. I agree Sue, it should be the responsibility of the company, but as you say it is probably difficult to enforce. And if they claim it is still an active mine they might get away with it? Anyways – gold rush stories have always fascinated me so it was fun to see a piece of it myself! Thanks for taking the time to leave a comment! Nice post Inger; I like your affinity with all the technicalities and machinery. Western Australia has a very rich mining history – it still is the big motor for the Australian economy. I’m afraid this will always put pressure on the environment although the big companies now are very aware of the fact there is ongoing public scrutiny about these issues. That was very different in the past as your trip has learned. Thanks Maurice! I couldn’t figure all the details out when we did the hike as there was limited time to study all the details so had to do some research back home. 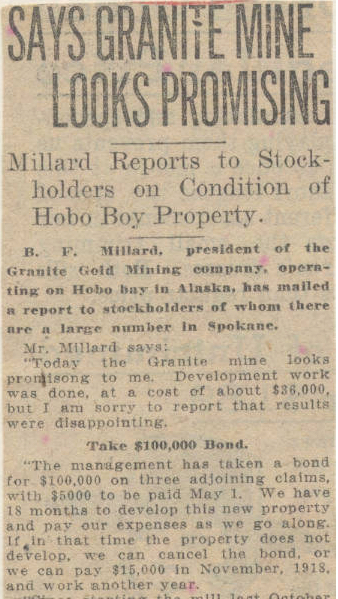 I have always found the old gold rush stories fascinating. I have heard mining is big in Australia. What is it mostly that is being mined? I understand Australia is one of the biggest gold producers in the world. There is definitely a much bigger scrutiny nowadays, fortunately. Like I mentioned to Jim above here in Alberta government collects financial security from mining companies to ensure there will be money for reclamation (and that the tax payer does not get stuck with the bill) should a company go bankrupt. And there is also very strict regulations when the mine is active. I am sure Australia would have very similar regulations. Unfortunately 3rd world countries might not have the same strict regulations…but hopefully that will change with time. 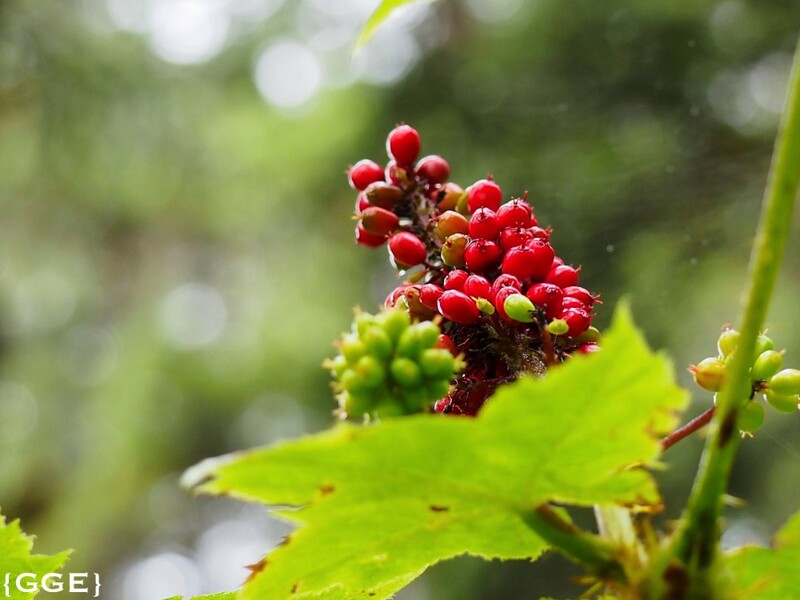 Great post and photos. 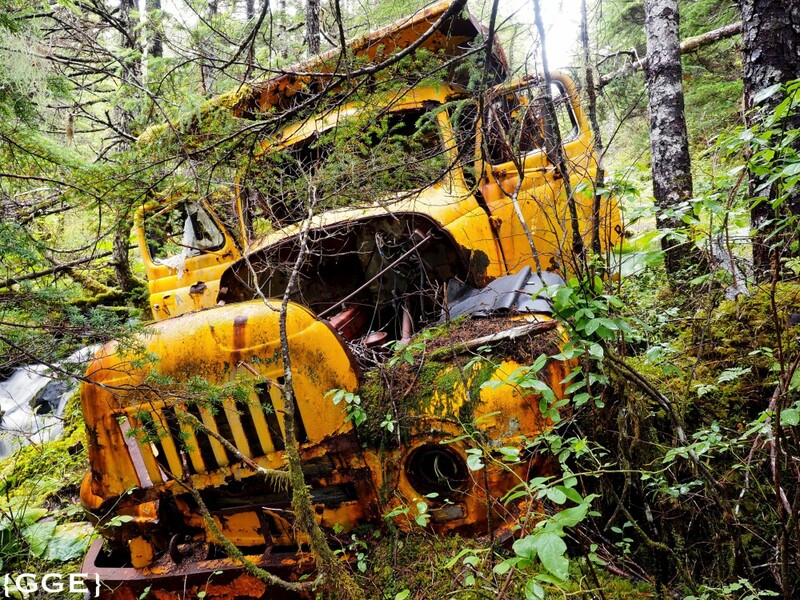 How in the world can a company rid heavy machinery and chemical remnants from remote Alaska? I d0n’t know. I must admit that it’s kind of cool to see the old train engines and ore buckets while driving the vast territory. At least the environmental impact is currently a factor for a new project, where it wasn’t in the “old” days. Thanks Ron! All I can say is if they were able to get it into Alaska (in 1890-something) they should be able to get it out again in 2015…hehe:) Anyways – I definitely agree with you, it was exciting to see a piece of gold rush history. Walking this trail was like a treasure hunt, something new showed up around every corner. Thanks for taking the time to leave a comment, much appreciated! Thanks Lucy! It was a stunning place. And I have always been fascinated by gold rush stories so it was exciting to see a piece of the history. Exploiting the nature resources will unfortunately always put pressure in the environment, but fortunately regulations and awareness is much stricter today than it was more than 100 years ago. Thanks for taking the time to leave a comment. I agree Jane that these types of remnant can act as learning and reminder for the future. Fortunately regulations are much stricter nowadays than 100 years ago. I have always been fascinated by the gold rush stories so it was interesting to experience a piece of it for myself. Walking along the trail and coming across an old bed definitely makes you think about how it must have been working here 100 years ago. History is fascinating! Thanks for taking the time to leave a comment! 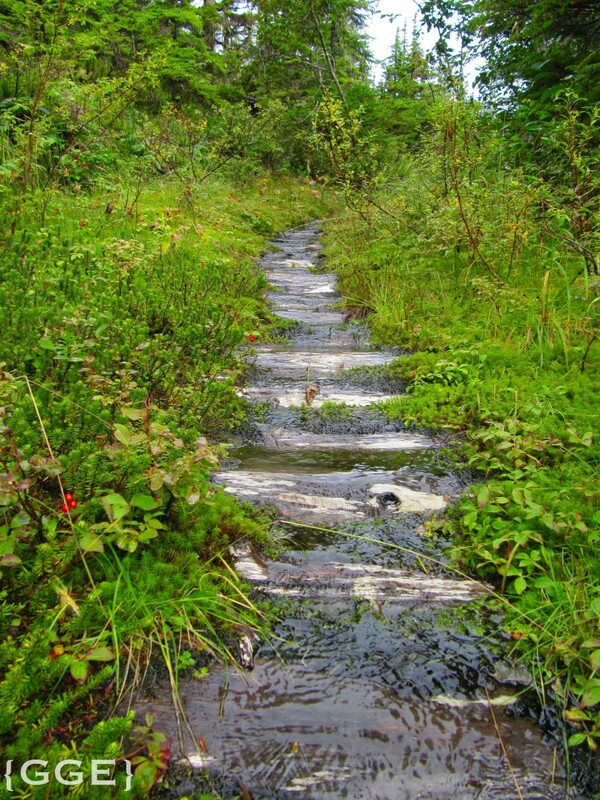 When I go hiking, I like to pretend Im the first person ever to set foot on the trail. That would be a very difficult fantasy to maintain on this particular hike . . . . Yes – that would be very difficult on this trail. It was definitely a different type of hike, more of a treasure hunt with something new around every corner. Thanks for stopping by! 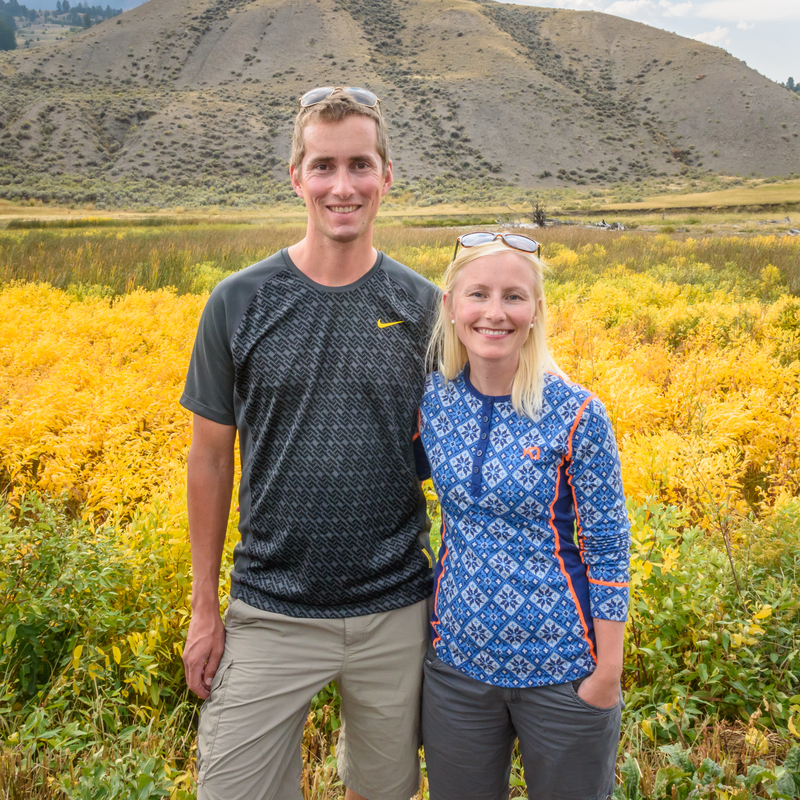 Thanks for taking us to the mining site, Inger, I enjoyed your hike and photos a lot. Also enjoyed reading about the mechanics, knowing you have an engineering background. It’s always tricky with the environmental factors, and it’s good that you brought it up. Mining is a topic that is easy to criticize for all the environmental damage it does, yet we all still keep using items that require mining (like cell phones). So I agree with you in having mixed feelings about it all. Thanks Jet. It was definitely a different type of hike than I normally do – this one was more of a travel through history. It was fascinating seeing all the remnants from the gold rush and thinking about the people who worked more than a 100 years ago. Exploiting the natures resources is always going to put pressure on the environment, but fortunately the regulations around mining is much stricter today. In Alberta the government collects financial security from mining companies to ensure there will be money for reclamation (and that the tax payer does not get stuck with the bill) should a company go bankrupt. As you say it is easy to criticise companies doing the mining, but it is all about supply and demand. We are the ones creating the demand. Had there not been a demand there would be no one mining. Appreciate you insight – thanks for taking the time to comment. Thanks Amy, I agree it is concerning thinking about all the old unreclaimed mines out there. Fortunately regulations are stricter today than they were a 100 years ago. 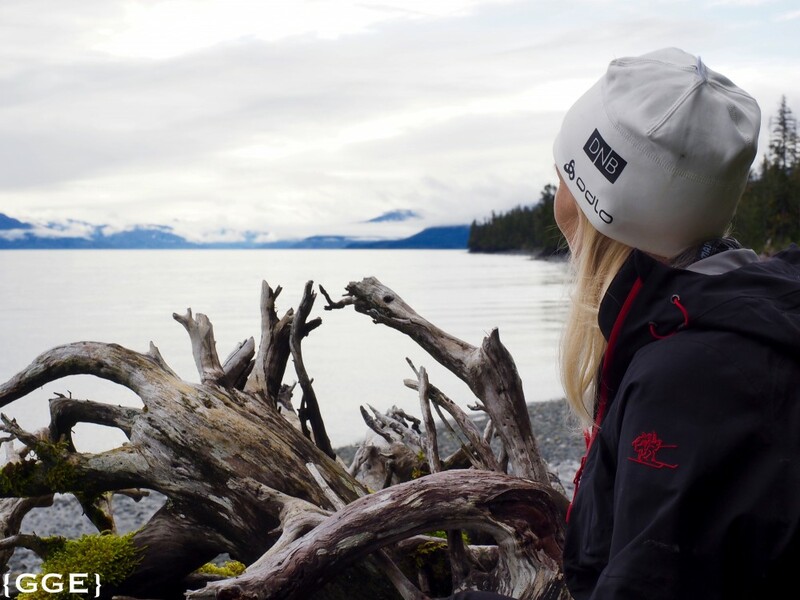 Alaska is on my bucket list, thanks for sharing the images of your hike. You will not regret putting it on your bucket list. We had an amazing 3 weeks up there during our travels there in September. We enjoyed it so much we are considering going back this summer:) Thanks for stopping by. I definitely had mixed feeling about this hike. One one hand it was exciting to experience a piece of gold rush history. On the other hand it was bit sad to see items scattered around the area, but that is just visual. More concerning is probably what is left in the ground and in the tailings. Thanks for taking the time to leave a comment. Thanks – it was definitely exciting to experience a piece of gold rush history. Fortunately regulations and awareness around mining is much improved today compared to a 100 years ago. Thanks for taking the time to leave a comment! beautiful place! 🙂 thank you for sharing this piece of mining history. so sad how it ended this way. Thank you! I have always been fascinated by the gold rush stories so it was interesting to experience a piece of it myself. Hopefully this is not the end of it – when I did some research around the mine I got the understanding the mine is still privately owned some maybe there is hope to get it reclaimed one day? Thanks for taking the time to leave a comment. Thanks! After hearing and seeing movies about the Alaska gold rush it was definitely exciting seeing a piece of it for myself. And I was happily surprised some of the wooden structures were so intact. It definitely felt like a treasure hunt not knowing what would be around the next turn. Thanks for taking the time to leave a comment. Interesting post (again)! 🙂 I wonder why they didn’t clean up, just leaving that machinery in nature like that. Looks almost apocalyptic. Thank you! I can just assume it was/is considered to expensive to clean up – too bad. But I’ll admit it was quite interesting to see the remnants from the gold rush stories I have heard so much about. Thanks for taking the time to leave a comment. Inger, you have a BEAUTIFUL blog here. The photography is amazing and your writing is thoughtful and entertaining. The gold mine you visited was beautiful in its decay, but I agree, man has a way of hitting and running without thinking of the impact that’s made on his surroundings. That area of the world is so very beautiful! Thank you Elisa, you made my day:) The gold mine hike was a beautiful hike despite the remnants from the gold mining days. It was almost like an treasure hunt, a bulldozer around the next corner just after passing an old bed frame. 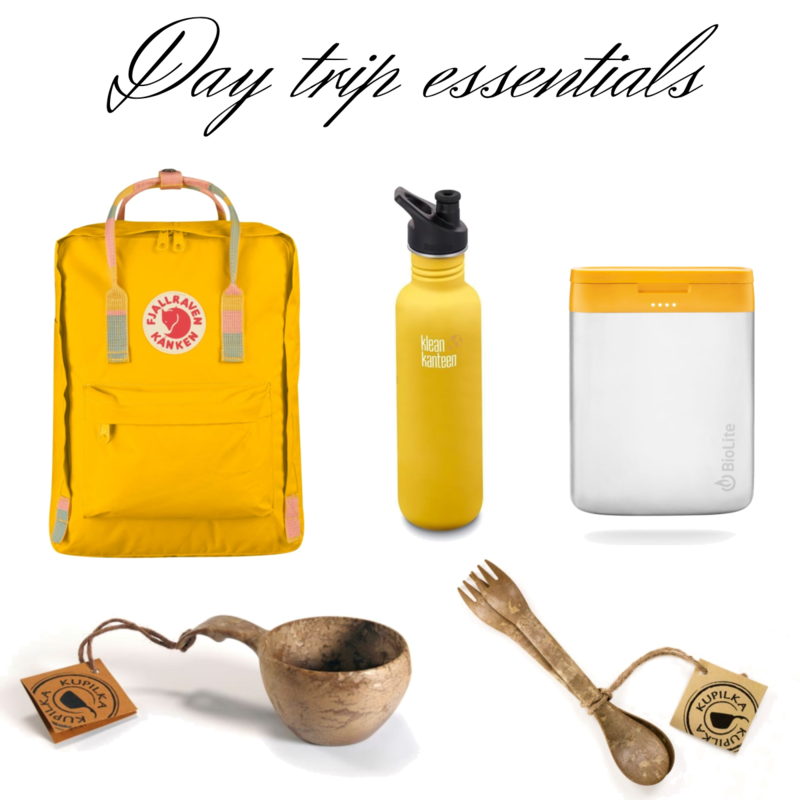 These items could feel like they are polluting the visual beauty of the area, but more concerning is probably what is left in the ground and the tailings after these old mines. Fortunately regulations are much stricter today. It was an interesting walk through history. Thanks for taking the time to leave a comment! Yes, that debris and mining tailings can definitely leach out and get into the water. I live near the old mining town of Bisbee AZ. There are problems with the water and the soil too. Soil damage was due to the old smelter that was once in Bisbee. All the tall trees for miles around were logged for use in the wood-fired smelter. So sad! There used to be a forest on our mountain. But Bisbee is now a former mining town and has reinvented itself into an arts-based community with lots of good little independently=owned restaurants, two breweries, and two coffee roasters! All that with a population well under 6000. Sa to hear about the issues Bisbee experienced as a result of the mining activity, but glad the city it doing well now! Two breweries, would love to try them! It is always fun to try the local made brews. Thanks for taking the time to leave a comment. You raise such important concerns in your blog. At least the earth seems to be reclaiming much of this mine as the remnants decay…there are so many active mines today destroying the land around them all over the world. Your photos are beautiful – some in a sad way. Conservation is definitely an important one. And a difficult one at the same time, the need for minerals and energy is continuously increasing as we increase in number and wealth – at the same time we become more aware of what our life style is resulting in. Not an easy one to answer. Nature was definitely taking back this area:) Thanks for taking the time to leave a comment. I guess there were no regulations back in the ‘old’ days with regards to reclamation of a mining area. Fortunalty regulations are much stricter today. I know that here in Alberta the government collects financial security from mining companies to ensure there will be money for reclamation should a company go bankrupt. Unfortunately that kind of ‘luxury’ might not exist is developing countries. I definitely share your concern about mining activity polluting the ocean. Thanks for taking the time to leave a comment Indah. I felt the same way when I went on my hike through some old mining ruins. It’s interesting to see, but you wonder why it doesn’t get cleaned up. Maybe for the tourism? I was thinking no one want to take the cost of the clean up, I didn’t consider that it could be left for tourism. I got the impression the place was not visited that often as you need a boat to get there and the trail was not the best in some location, but you never know I guess. Also, it seemed the mine was still privately owned and in theory could be re-openend. Might be part of the explanation. Thanks for taking the time to comment! I felt the same when I hiked to Monte Cristo ghost town here in WA. Lots of old decaying equipment was scattered around and signs suggesting possible contamination were posted. It seems like once the mine stopped producing it was cheaper to let the equipment behind than to move it. It was interesting to see some of the items but at the same time it made me sad that such a beautiful valley is littered by object that can hurt the environment. Luckily for Monte Cristo, a massive clean up is scheduled for this year. The area is closed to hikers and when it reopens, hopefully later this year, it should provide safer experience. Hopefully some of the mining areas in Alaska will see same future. I left with the same impression – cheaper to leave everything behind than cleaning up. I am glad to hear Monte Cristo is getting a clean up! I have no idea how many similar sites there are up in Prince William Sound and other locations in Alaska. Would be nice to see them cleaned up to eliminate the risk of pollution, especially to the ocean. Thanks for taking the time to leave a comment.